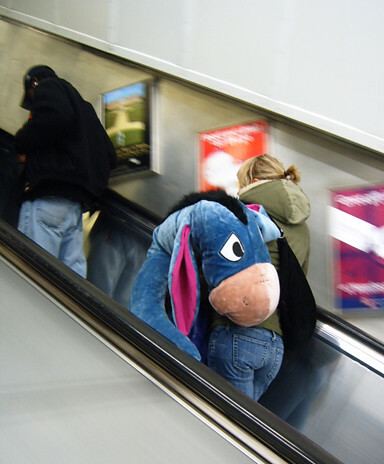 Delighted to see this guy on the London Underground yesterday lunchtime. 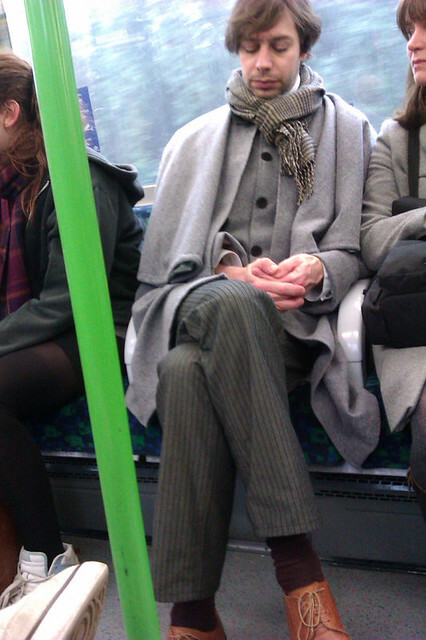 Not sure if he was going to watch the new Sherlock Holmes film or if this brilliant outfit was his normal clothing. Either way he just needed a deerstalker hat to complete the look. Actually does the Robert Downey Jnr Holmes wear a deerstalker hat now? The planned strikes from Tube drivers union Aslef are on hold after the union held "meaningful talks" with London Underground today. More discussions are due to take place next week. 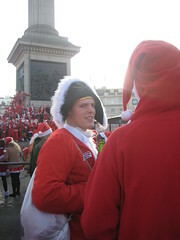 Aslef's members staged a 24 walkout on Boxing Day in a dispute over Bank Holiday pay. 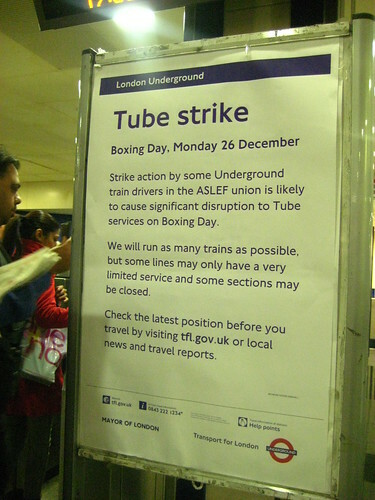 Further strikes were planned for 2012 on 16 January, 3 February and 13 February. London Underground's chief operating officer, Howard Collins, said: "I welcome the constructive approach taken by the leadership of Aslef at our discussions today. I look forward to further constructive talks next week, as we work to resolve this issue." Let's hope the talks are indeed constructive & we don't face the prospect of strikes in the New Year. As you ready yourself for the increases get set to know that we are already paying almost 10 times more for our season tickets than fellow Europeans. New statistics from the Campaign for Better Transport (CBT) show that that rail travellers on the continent are paying far less for their trains. 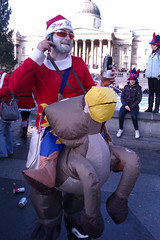 "The price of a 2011 season ticket from Woking in Surrey to London, including Tube travel in the capital, is £3,268. Yet a similar 22-mile journey from Velletri to Rome costs Italian season ticket holders £336.17" report The Press Association. The 24-mile journey from Ballancourt-sur-Essonne to Paris costs £924.66. While the 21-mile Strausberg to Berlin route is £705.85 and if you're commuting in Spain, the 22-mile Collado-Villalba to Madrid journey costs £653.74. 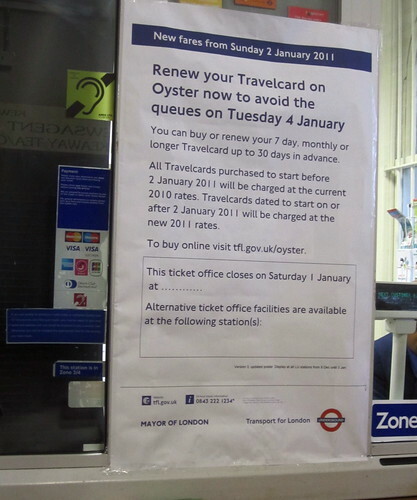 From January 2nd 2012, UK regulated fares, which include season tickets, are rising by an average of 6%. The overall average rise for all tickets is 5.9%. 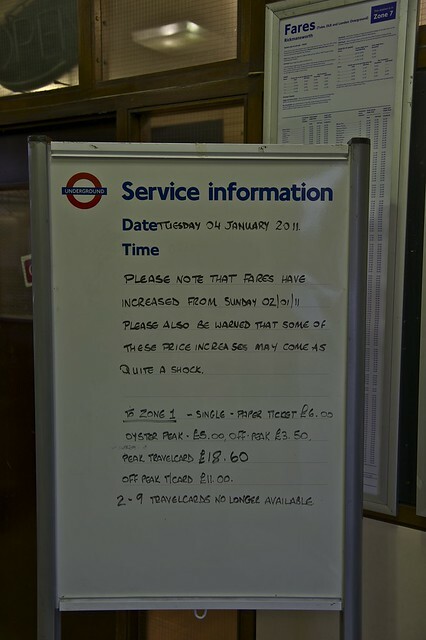 Fares on TfL's services for 2012 will rise by 5.6% on average. The Campaign for Better Transport public transport campaigner Sophie Allain said: "When the cost of season tickets is so much higher than other European capitals, the Government's fare rises are starting to affect the UK's competitiveness. That's why if the Government is serious about promoting economic growth it must also look at reducing planned fare rises in 2013 and 2014 as part of a policy to cut fares and make public transport truly affordable." As they say "make sure you buy your travelcard in the next couple of days. It could save you up to £11.50 on a monthly ticket or £120 on an annual (zones 1-6)." If you're wondering why there are closures on certain parts of the Circle, District, Metropolitan and Hammersmith and City lines up until December 30th 2011, it's to test out the new signalling equipment around Edgware Road London Underground station which has been installed for the new, longer, air-conditioned trains, rolled out on the Tube network next year. The voiceover in TfL's video says of Edgware Road: "Believe it or not the station is still run with 1920's kit" I'd believe it. The new trains will be 23 metres longer than the old ones. However, as a result of the extra length, the antiquated signalling system has to be modified and now it needs to be all tested out before it can be put in to use. Apparently this is particularly crucial for the Edgware Road area as it's one of the busiest on the Tube network "the Spaghetti Junction of the Underground" and where the lines mentioned above meet. TfL said "A replacement bus will be provided which will run from end to end along the closure route. This service will run every 10 minutes and will be monitored and supplemented if necessary." Find out more on TfL's site. Anyone watch the first episode of new BBC series of "The Borrowers" on Boxing Day evening? It's a wonderful adaptation of much loved childrens' books by Mary Norton starring Christopher Eccleston, Stephen Fry & Victoria Wood. The eagle eyed amongst you may have spotted that when the Borrowers (tiny people who live under floorboards) left their home after being discovered, they travelled to The Borrower's 'city' which appears to be below the platform of a disused London Underground Station. Many thanks to Pete of The Londoneer for letting me know about The Borrowers. If you're in the UK you can watch the full episode of The Borrowers on iPlayer for the next few days. 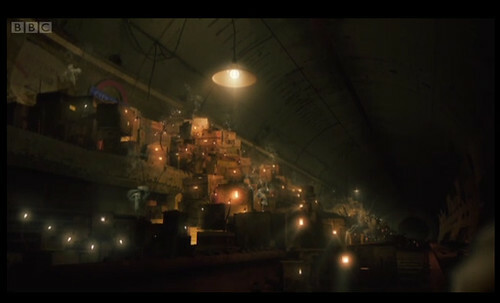 Look out for the Tube station first seen at 27mins 43 seconds in. Every so often I get an email or a Tweet from someone saying "Have you seen this about the Tube?". In about 90% of cases I have, and have either blogged about it a while back or it was on my radar to blog about in the future. However, in the 10% of cases where I haven't it's usually something lovely or fun or interesting and I'm compelled to share it straight away. I was delighted to hear that Penney Design has created five really cool retro looking illustrations/infographics of "ghost" or abandoned London Underground stations. Robert Penney said of the stations: "Many remain fairly intact and some even feature time capsule-like qualities, such as WWII propaganda posters hanging from the platform walls." I love how some of the infographics have little wartime ads on them to "Save Your Scrap" or "Confirm your Confidence in Churchill"
Each of the five infographics has opening and closing dates for the stations and facts about why they were closed and interesting connections relating to their use in the war, whether they were used in film or TV, in music videos or in computer computer games. You can see the full set here and they're also available as posters. Thanks so much to @ConsultantHead who told me about them when he saw them on Retronaut. 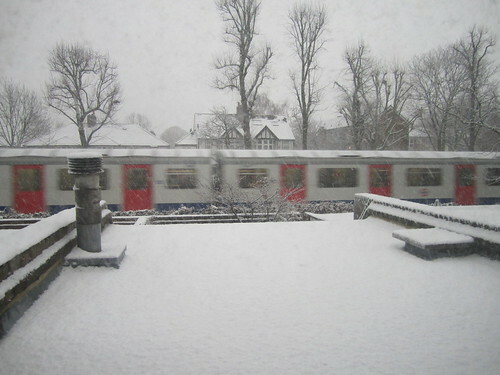 For the many people that have been asking, unfortunately, yes there is a Tube strike today (December 26th 2011) by Tube drivers. Members of the train drivers' union Aslef are staging a walkout in a row with London Underground over pay. If you were planning on using the Tube today, you'd be very, very wise to find alternative arrangements. London Overground doesn't run on Boxing Day anyway, so don't think about that as an alternative. However, Bus, DLR, Tramlink and some River services will all run. TfL have added a section to their initial press release on the services they expect to run. In a nutshell, services on all lines are extremely limited, with very reduced frequency on those lines that are running for a small part of the line. The earliest any trains start appears to be 8.30am (limited shuttle service Ealing Broadway & Acton Town on District Line) other limited services start at in the main at 9.30am. My advice, walk, get a bus (extra buses will be provided on many bus routes particularly in the central London area) or use a Barclays Bike if you're that central. For those who are interested, the strike over pay involves the majority of drivers asking for additional payments plus a day off lieu for working on the bank holiday. London Underground are pretty miffed by this as the staff concerned are already earning a premium in their annual salary for working on public holidays. We also have further days of strike action to look forward to in the New Year as Aslef are planning to hold three further strikes in 2012 on 16th January, 3rd and 13th February. 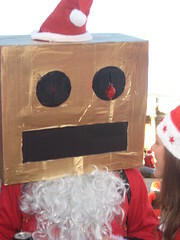 Happy Xmas. The one day there is no public transport in London, no Tube, no London Overground, no DLR, generally no buses just a few buses operating from airports. Also remember Boxing Day travel on the London Undeground will be challenge with the Boxing Day Tube Strike. 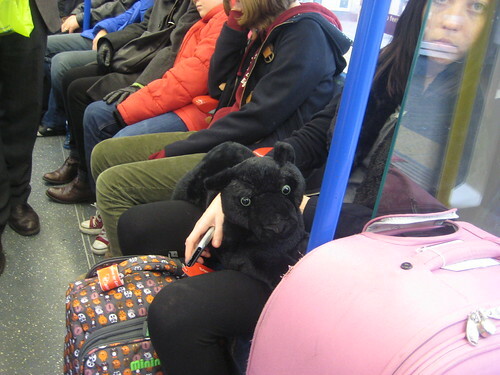 I thought I'd give you a seasonal greeting from my cat Bolli & other Tube travelling festive pets. 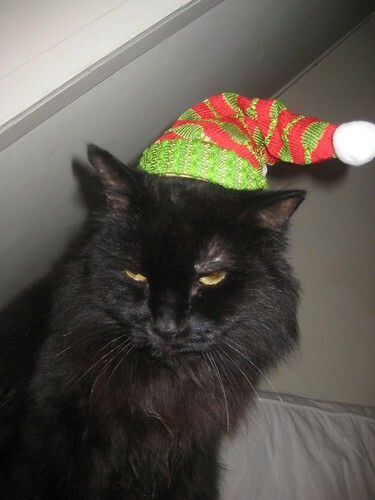 As you can see Bolli loves wearing his Santa hat! Both the panther and its owner had fairly hypnotic eyes. 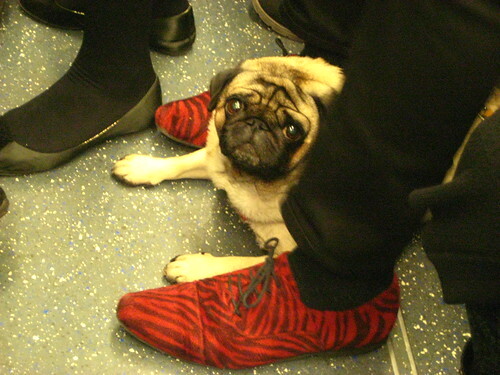 Moving onto a slightly less attractive pet, with a mournful looking pug on the Tube. I loved this little creature though and couldn't stop giggling at its expression. The pug looked up at me as if to say "Why are you laughing at my face?" 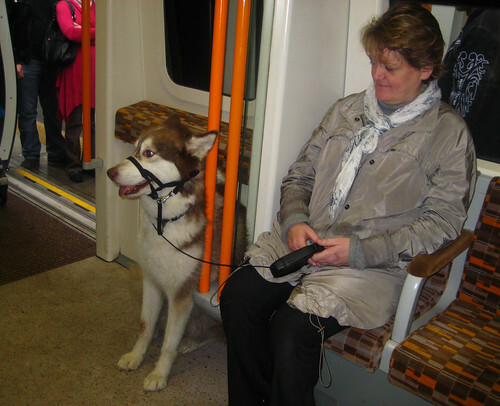 Finally, not on the Tube but Christmassy nevertheless was this huge husky type dog I saw on the London Overground. Unlike last year, there's no snow forecast in London over the Christmas break, so no need for him or her to get involved in any snowy rescue duties! 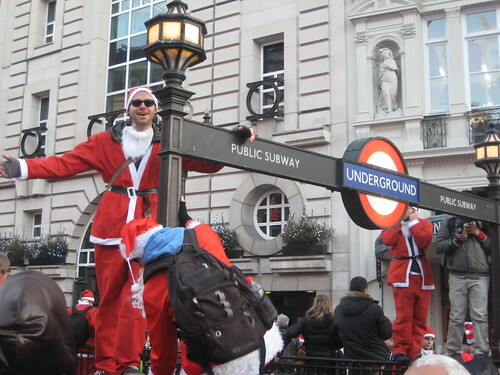 Enjoy Christmas Day & watch out for latest updates on TfL's site if you were planning on using the Tube on Boxing Day. 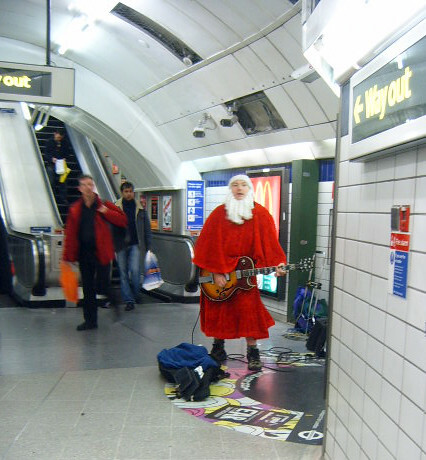 You'll see & hear your fair share of singing Santas, people singing Christmas Carols for charity and a whole host of other music on the London Underground right now. 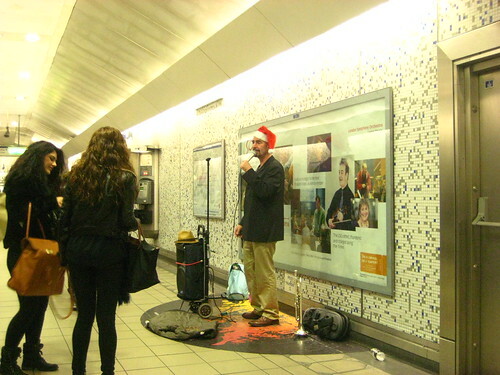 I saw this singing busker in the underpass at Green Park Tube the other day, who clearly thought that wearing a Santa hat rather than is normal hat (seen propped on an amplifier) would be a way to bring in the coins. He was right as a number of people stopped to give him cash. 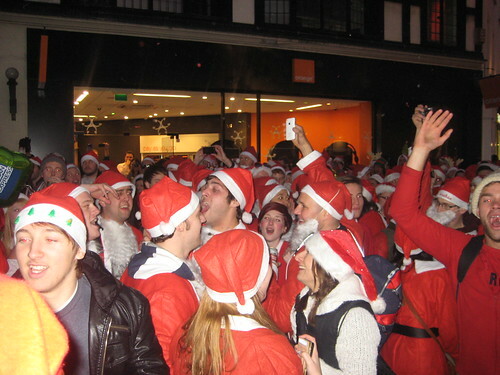 This following two busking Santas from a few years back still remain my personal favourites. The first as he was hugely enthusiastic. London Underground has lost a last minute High Court bid to stop the Boxing Day strike on December 26th 2011 by Tube drivers. Members of the union Aslef are staging a walkout in a row with London Underground over pay. They are after additional payments and a day off lieu of working on the bank holiday. This is despite the staff concerned already earning a premium in their annual salary for working on public holidays. 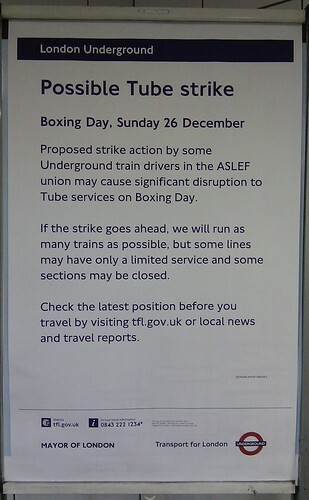 Aslef are also planning to hold three further strikes in 2012 on 16th January, 3rd and 13th February. London Underground (LU) contested the validity of the Aslef leadership's ballot for strike action, as the union had balloted all of its driver members for action despite only a quarter of LU's total of 3,500 drivers being needed to work on 26 December. However, the court decided that Aslef's ballot was not invalid. General Secretary of Aslef, Mick Whelan, said "Whilst we’re obviously very pleased with today’s verdict, we feel that two days have been wasted going through the courts when we could have spent that time finding a resolution to this dispute." Howard Collins, LU's Chief Operating Officer, said: 'The Aslef leadership is calling strike action over an outrageous claim for even more money to work on a day for which their members are already being paid. We have done everything we can to avert this needless action, including reducing the impact of Boxing Day working on staff and, as a last resort, taking legal action. 'We remain ready at any time before these four strike days to work with the union's leadership to resolve this issue through talks, and I urge them to get back around the table. 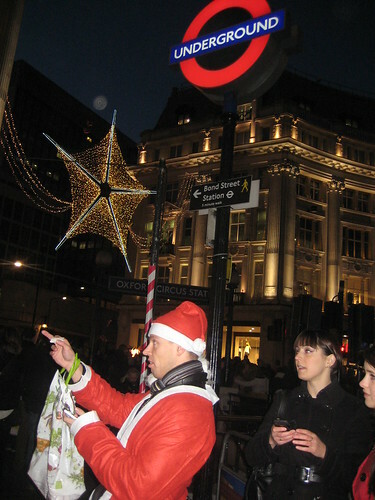 Caroline Pidgeon, Leader of the Liberal Democrat London Assembly Group, said: "This strike is unwelcome as it will harm London’s retailers, disrupt numerous Boxing Day events and lead to more cars on London’s roads – it is the last thing London needs. "Londoners who are just days away from being hit by large Tube fare rises will find it hard to understand why this strike is really necessary." She's got a point! What do you think? 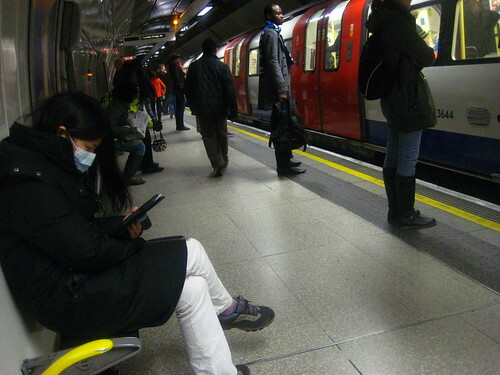 You know it's Christmas on the London Underground, or at least winter, when the carriage is full of people sniffing, when the minute you cough someone instinctively pulls their scarf up over their face so they don't catch your germs and when you see people (mainly Japanese) wearing "flu masks". I understand that these are supposed have a double whammy of not only protecting you from other people's germs but also to stop you spreading your own bugs around. Actually you're on a bit of a hiding to nothing if you try to keep yourself from getting a cold and you travel on public transport, you're likely to get a "Commuting Cough". Even though yesterday's Evening Standard gave advice on avoiding the "Cough-ice". Doctor Christian of the telly, so nicely said "Being squashed together in a packed Tube carriage with the disease-ridden public will guarantee you won't escape uninfected this winter." "Struggling into work when you are ill is not valiant and dedicated, it is foolish and will only prolong your own illness and virtually guarantee that colleagues will catch your virus too. Stay home and recuperate." 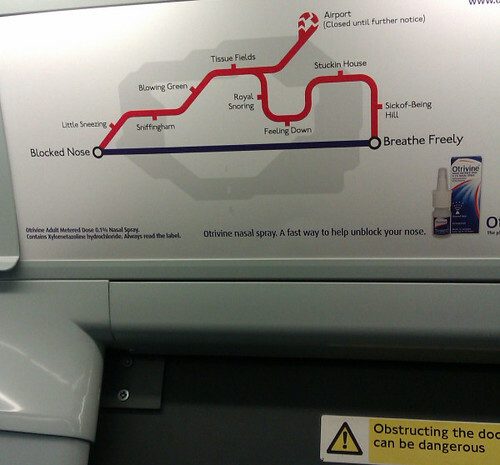 At least this one is Tube related with stops such as "Sniffingham", "Sick-of-being Hill"
My advice is layers, as you'll need to wrap up warm for the outside but remember the Tube is often over heated in the winter. 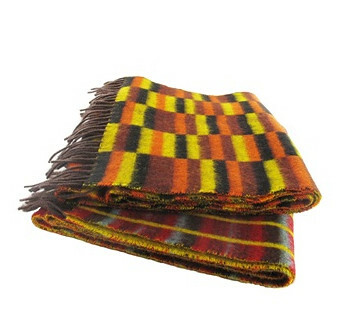 Finally, if you do want a stylish scarf to wrap round your face when the person opposite you has a coughing fit, you might like London Transport Museum's new Routemaster Moquette Design Lambswool Scarves. 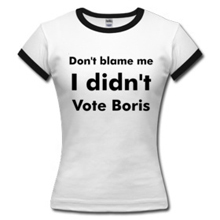 Possibly too late to order online for a Xmas pressie (they have them in their Covent Garden shop too), but it's nice for yourself at £24.95. 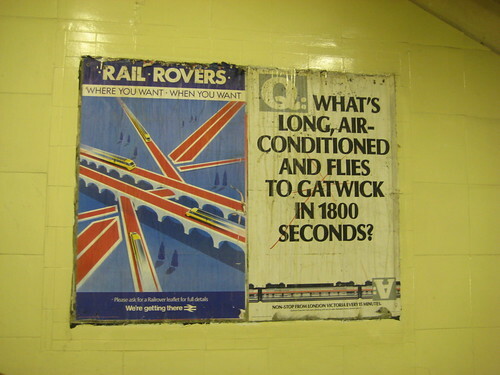 Following my post about the old posters revealed at Richmond Station, I was travelling through the other night and took some photos of more that have been uncovered there. 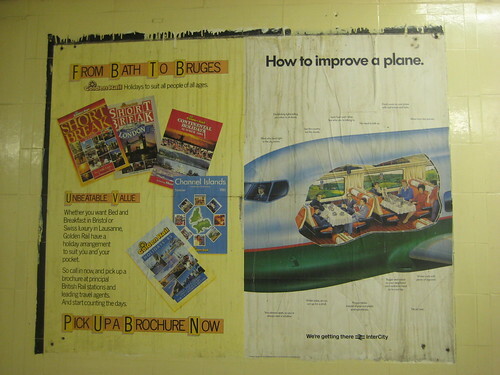 Simon Hickman from English Heritage had said "South West Trains is replacing the poster boards on the footbridge stairs, and in removing the old ones has uncovered some historic late '70s / early '80s ones underneath. They're very well preserved." It's funny how the designers thought they would show the Gatwick Express train upside down as the answer to their question. View it large to see captions like "Bigger seat space so your neighbour can't recline his head on your lap" and "Proper tables instead of pop out plastic postage stamps" and "See the country not the clouds". 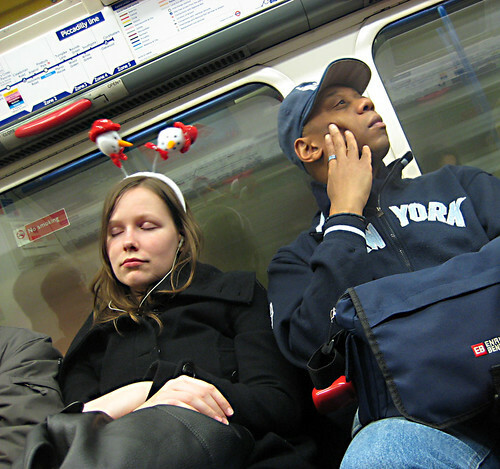 She tweeted: "Festive improvised tube seat! 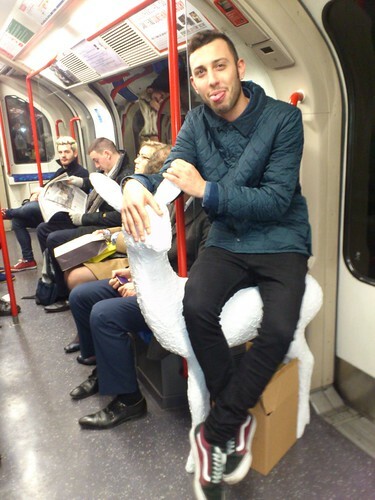 Bloke sits on deer on London's Central Line"
If you happen to see people with large gifts or using other strange things as seats, please us know in the comments. This week you'll see fewer people travelling in the morning rush hour on the London Undeground, as people are finishing work for the holidays. Yesterday morning in an unusually quiet carriage on the Northern Line, I spotted a guy wearing a Santa hat reading his book. He wasn't drunk. He wasn't off to a party. 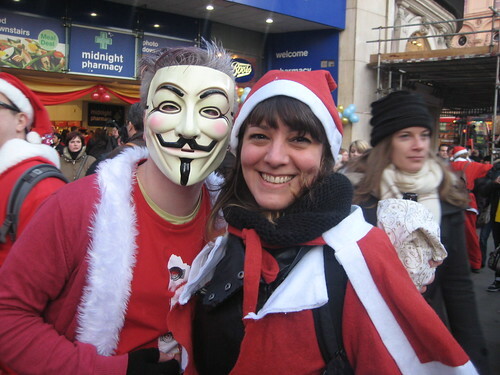 There was no sense of "look at me I'm wearing a funny Santa hat". 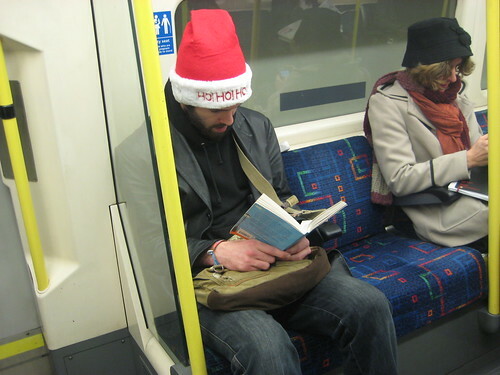 He was just reading his book as though the Santa hat was just the first thing he happened to have to hand to wear that morning. 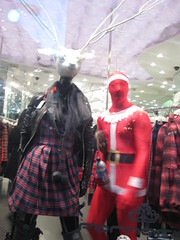 Obviously there will be a fair few people in more outlandish Christmas outfits or festive headgear, but I liked the casual look of this guy. Below is one of my favourite pictures from a few years back. I've no idea what the excited anchor man is saying, but I love the slightly Benny Hill'esque background music coupled with the bemused and confused insets of the viewers wondering why Londoners are looking at station whiteboards & smiling. Well done Thoughts of Angel, for brightening up our days & for flying the flag for Tube humour in Japan. 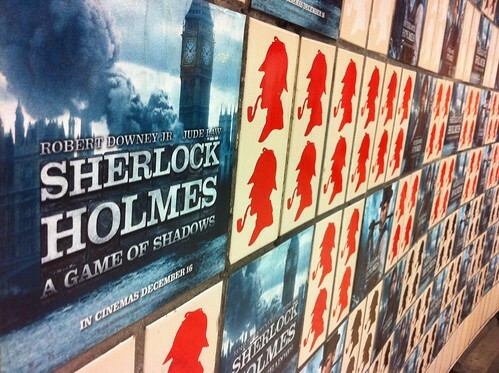 Fantastic spot by Lisa Lin who took a photo of Baker Street London Underground station on the Bakerloo line, where some of the lovely Sherlock Holmes tiles have been "re-tiled" for the promotion of the new Sherlock Holmes film with Robert Downey Jr & Jude Law which opened on 16th December 2011. Obviously these are stickers rather than brand new tiles, but the impression is just as good. 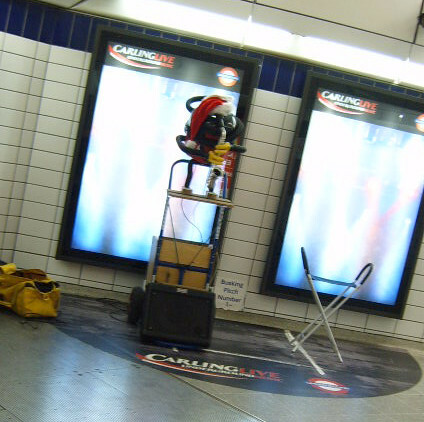 Wonder if we'll be seeing more inventive re-tiling like this on other Tube stations? 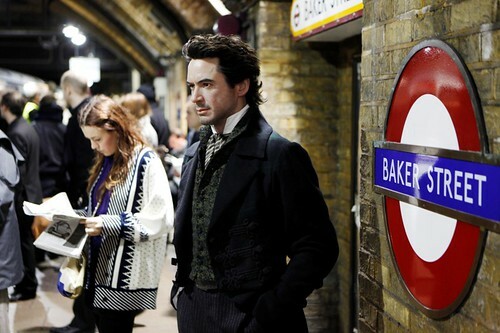 To promote the release of the last Sherlock Holmes film in 2009, a wax work of Robert Downey Jnr in his Holmes attire was placed on a number of platforms of Baker Street London Underground stations looking as though he was waiting for a train. One of the biggest signs of Christmas on the London Underground, is TfL's annual poster advertising Xmas & New Year Tube, Rail & Bus operating times and their "timetable". 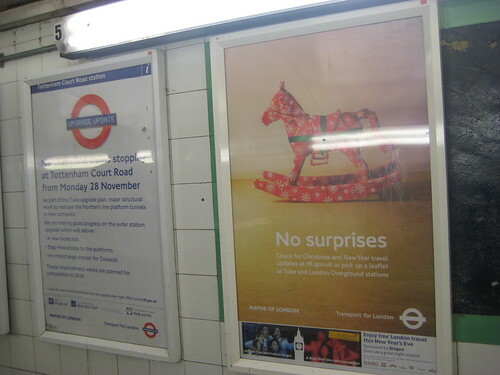 I initially thought they'd chosen to use this picture of a rocking horse as if the Boxing Day Tube strike goes ahead, trains on Boxing Day will be as rare as the proverbial rocking horse's droppings. But it's supposed to show that if you look at their Christmas & New Year Travel Guide pdf in advance (like this gift wrapped rocking horse) there will be no surprises! You'll also see signs at your local station with their specific ticket office opening and closing hours over the festive period. 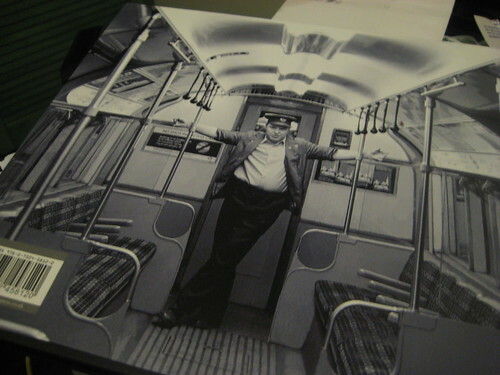 One of the most beautiful books about the London Underground I have ever seen (& trust me, I've seen a lot). 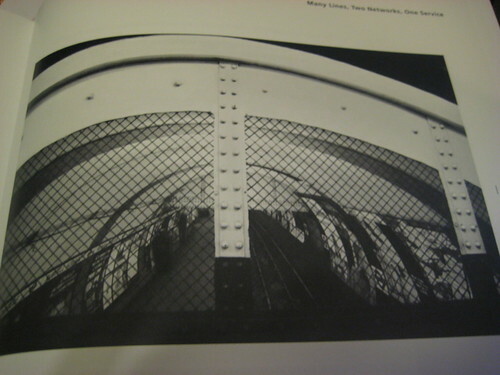 This new book London Underground: Architecture, Design & History by David Long with 80 amazing black and white photographs by Jane Magarigal dating back from the 1970's "weaves the story of the Underground - its abundance of characters (some good, some not so good), design firsts and brand identity. From suburban expansion to Blitz bombings and Soviet adulation, this book celebrates what remains a magnificent engineering and aesthetic achievement while providing an affectionate if slightly elegiac portrait of a London which is now gone for good." 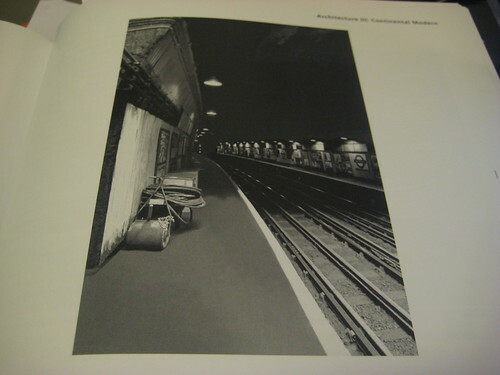 That was the book's "blurb" but I was extremely lucky enough to receive a review copy of the book, with the wonderful new book smell adding to the atmospheric "empty London Underground" shots. I could have spent most of this review focusing on David's hard work documenting the history of the London Underground where he looks at all people who made the Tube look how it does today. 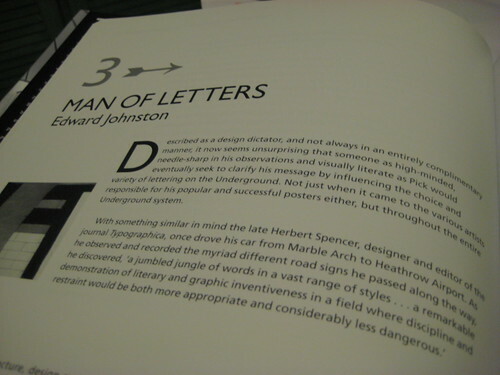 That includes its many architects to font designers like Edward Johnston and of course Harry Beck who designed the most popular Tube Map in the 1930's which we still base our current map on. 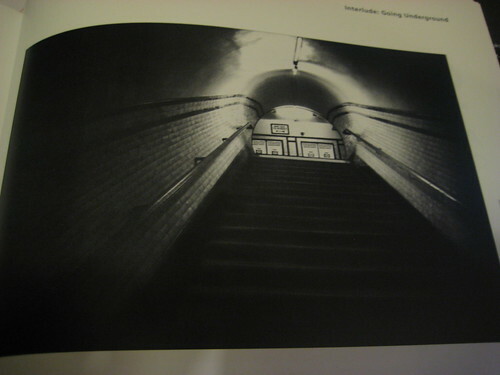 However, the photography is so stunning that it really becomes the book's hero and as many of you know the allure & spookiness of looking at photographs of an empty Tube, and may be keen photographers yourself, I want to turn my attention to the photography. The story of how Jane Magarigal came to take this photographs was really fascinating to me as it shows how just an outsider's love of the Tube, photography, hard work & patience can eventually pay off. 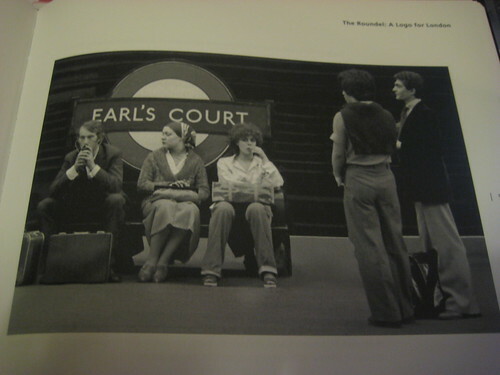 Jane is American and first came to London in 1976 and was struck by the beauty of the London Underground when she arrived. "In one of the most beautiful & interesting cities in the world, I became a mole, travelling hundreds of miles exploring one stop after another, never knowing what was above ground. Unless I was running errands or visiting friends, I never left the stations because it would cost to get back in". "a monopod or tripod is recommended in order to get sharp pictures - dangerous to use in crowds, extremely time consuming and awkward if needing to leave the area quickly. So I stood planted firmly to the earth, elbows tucked tightly to my diaphragm and held my breath, waiting for just the right moment when, for example, all people had vacated the area or when a commuter hit the right spot." As many of the images were taken in the 1970's they actually look "historical" already. Jane attempted to market her shots but the time wasn't right. She also went back to America but in 2009 returned to London and bought the series back to life with digital photography. The more architectural shots, void of people, speak of this as well. It is when stations are empty of people that the history of the place comes alive. For without the bustle of people one can feel the energy of by gone days - the Blitz raging overhead, the architects and designers' choices, the souls of plague victims unearthed in the building of the London Underground, the millions of people who have travelled through this miraculous labyrinth; all of this is there". I'd like to thank The History Press for sending me a copy to review, but also for seeing the possibility of this book and not letting these pictures and David's story remain unseen. The book is available on The History Press's site and also on Amazon. 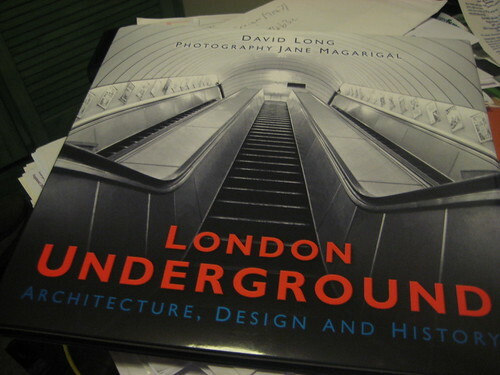 Any lover of photography, history, London and the London Underground would be happy to receive this as a gift. 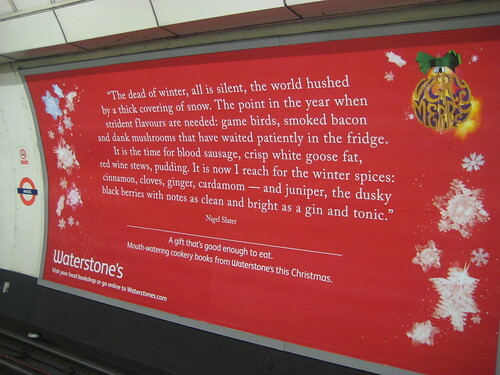 Another sign of Christmas on the London Underground is the Xmas related long copy cross platform ad. Obviously there are tons of ads for Xmas gifts on the Tube, but these "long copy" ads really stand out. They are specifically designed for when you're standing around, waiting for your train with nothing else to do but to stare at the ads opposite you. 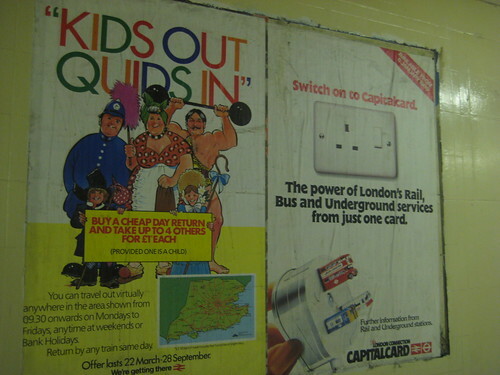 CBS Outdoor (the guys responsible for placing ads across London Transport) have been running campaigns & competitions to encourage more long copy ads, supposedly to improve Tube "ambience" but I imagine also to get more advertising revenue. Still if it produces a great read like the one from Waterstone's I saw last night for a cook book by one of my favourite TV cooks, Nigel Slater, I'm happy. 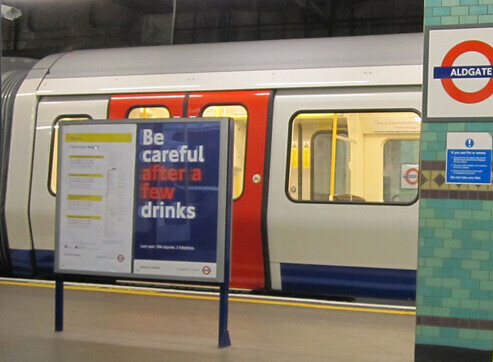 Want to see your quote on a Tube poster? 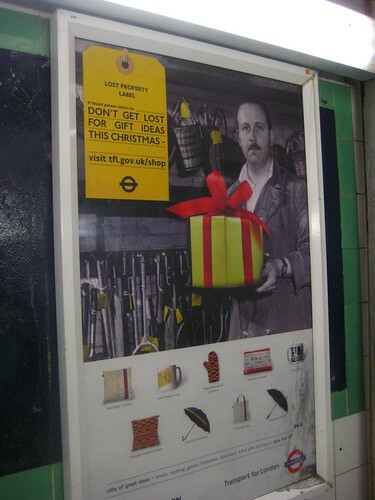 Obvious sign of Xmas on the London Underground is when you start to see TfL or London Transport Musuem's own ads for Christmas Gifts from their shops. I particularly like TfL's in this case with the "Lost property" theme. "Don't get LOST for Gift Ideas this Christmas". The Green Line brand, first established in 1930, was used for coach services linking central London with country towns within a 30-mile radius.The Green Routemasters were used on Green Line routes in outlying country towns, with a central station at Poland Street, Soho. 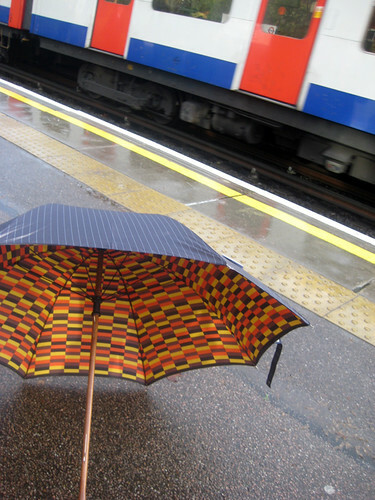 The Green Line Umbrella is based on a special fleet of Lincoln Green Routemasters. These were built for comfort with extra deep cushions featuring the now iconic Routemaster Seat Moquette. 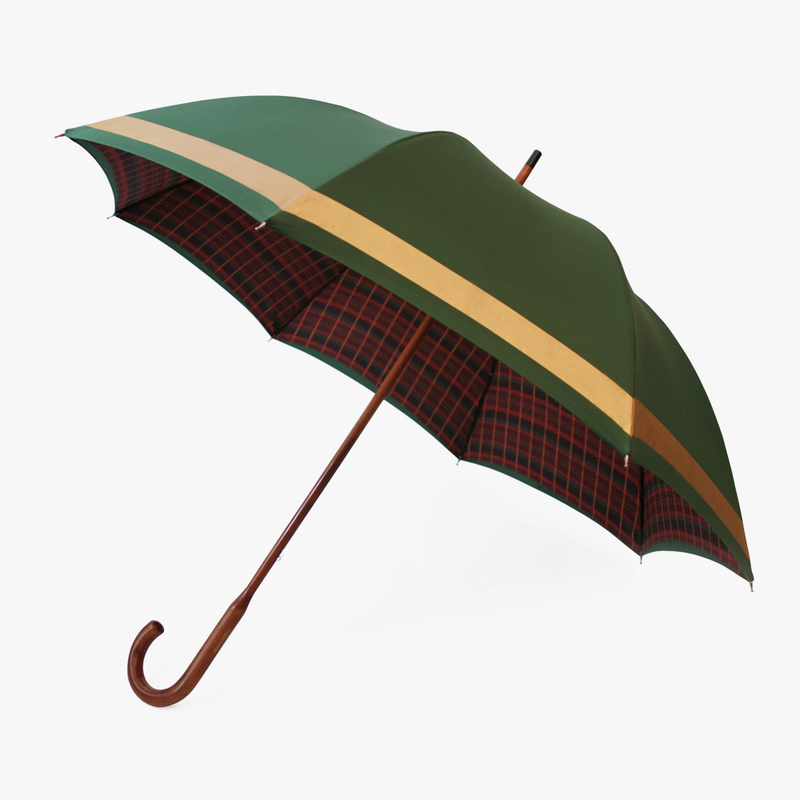 It’s this moquette pattern that makes up the interior of this special London Undercover umbrella and the Lincoln Green & Gold Paintwork, the exterior. 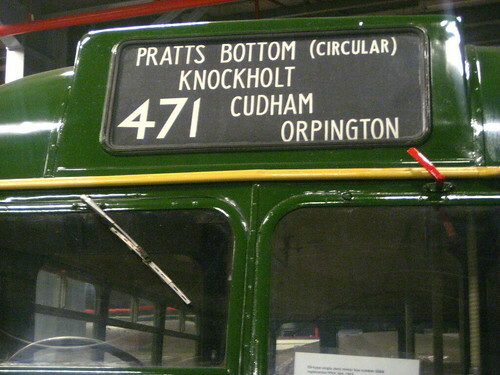 As I saw some lovely shiny Green Line buses on a recent visit to the London Transport Musuem's Acton Depot I'm tempted to get one of these myself. 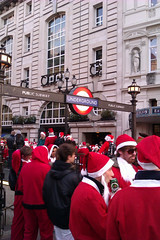 Sadly another sign of Christmas on the London Underground is the threat of a strike. This year (as with last year) Aslef haven't let us down and their members have voted in favour of strike action on Boxing Day. Aslef said in a statement: "The union balloted its 2,200 Underground drivers and they returned a 92.3% vote in favour of action. The company is currently offering no additional payments for working on Boxing Day. The union says its members require 'substantial incentives' to attend." Aslef added that further action was scheduled for 16 January, 3 February and 13 February. London Underground said the vote was not a resounding vote in favour, with only 42% of Aslef's Tube drivers voting for a strike and less than 1,000 members took part in the ballot. London Underground (LU) claims that Aslef is seeking triple-time pay and an extra day off for members working on Boxing Day. Howard Collins, LU's chief operating officer, said there was a "longstanding" agreement between LU and unions over working on bank holidays. He added: "It is disgraceful for the Aslef leadership to threaten strike action while we are engaged in continuing discussions on this issue. The threat of strike action will not achieve anything and I urge Aslef to join us in our commitment to resolve this matter through discussions." Sadly if the action goes ahead, it is likely to bring widespread disruption because the union represents 2,200 out of LU's 3,400 drivers. At the moment the RMT union, which is the second largest driver union at LU, has not balloted its members on the dispute. But one imagines they will support fellow union members and refuse to cross any picket lines. 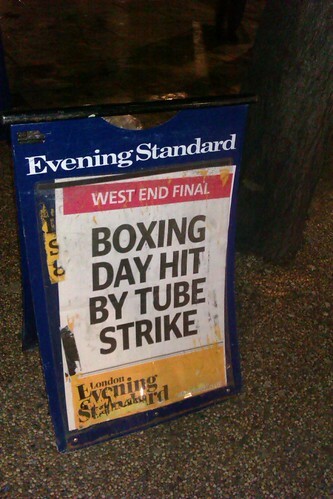 Update - Boxing Day Tube Strike definitely going ahead for 26th December 2011 as LU's attempt to get High Court to stop it failed. Day Two of the 12 Days of Tube-Mas & a big sign of Christmas on the London Underground is when you start seeing posters about free New Year's Eve Travel. As blogged when announced, booze company Diageo are the sponsors of this year's free New Year's Eve travel on buses, Tube, Tram and DLR services from 23.45 - 04.30 and on the London Overground until last train times. 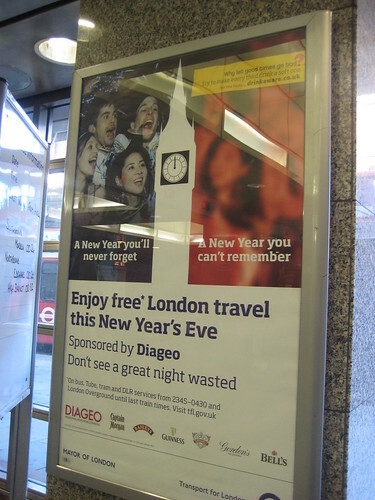 Diageo has signed a three year deal with TfL to sponsor free travel on New Year’s Eve. This first advertising campaign started running from 9 December and will carry on into until the New Year. I quite like this poster and am pleased it doesn't feature Lewis Hamilton who was in the publicity campaign to kick off the announcement. In their effort to sponsor responsible drinking, Diageo show a group of sharp revellers on the left of the poster in comparison to the rather blurred view & memory you would have of the same party goers on the right if you'd over indulged on alcohol. 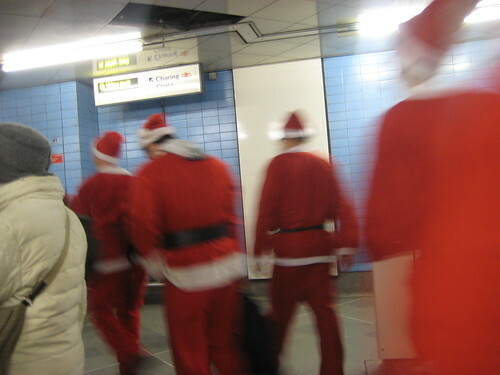 For me seeing a bunch of Santas on the Tube - Santacon is a real sign that Xmas is approaching. So I thought I'd spend the next 12 days with my own 12 Signs of Christmas on the London Underground. 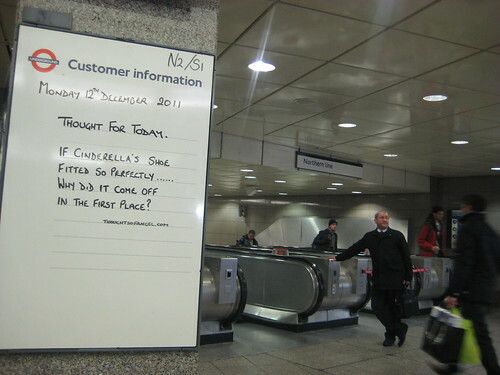 Today, it's those wags at Angel London Underground Tube Station with their Thoughts of the Day @ThoughtsofAngel. You know it's Christmas on the Tube when Thoughts of Angel starts talking about pantomimes. 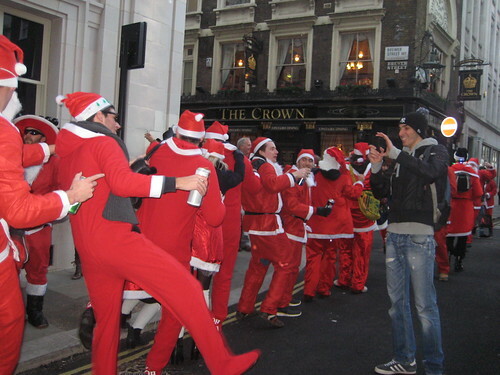 December 10th 2011: over a 1,000 Santas or Santae congregated in Central London (& other cities around the world) to celebrate Christmas in Santacon. 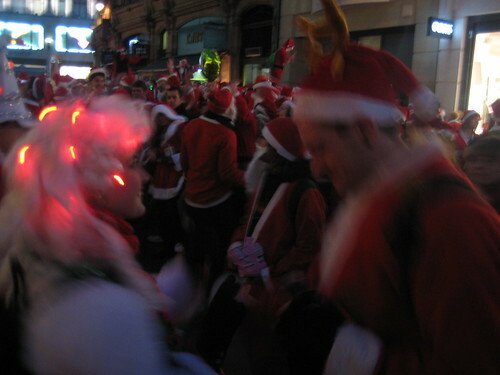 I've blogged about Santacon a number of times in the past, but this was the first year I went along myself, dressed as Santa. It was really pleasing to see that large groups of people could still meet up & move around London without it turning into a riot, getting violent or an excuse for police kettling. 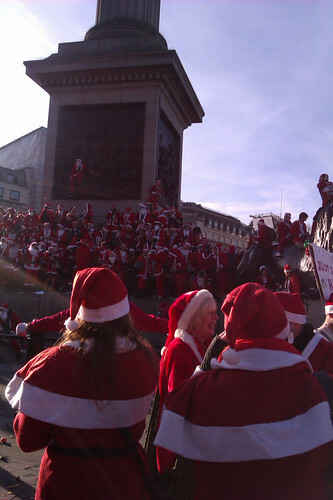 Here's my first sight of Santas en mass leaving Embankment Tube where we headed to Trafalgar Square, the lunchtime meeting point for Santacon. 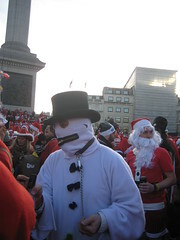 The atmosphere as like a carnival when we left Trafalgar Square and made our way to Piccadilly Circus. Even with masses of us in streets & when cars, motorbikes and buses were stuck in the Santae Jam, the drivers were good humoured as people gave them mince pies & sweets in the spirit of Christmas. 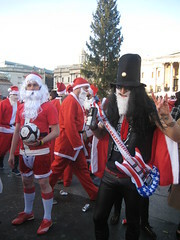 The Santa band of drummers were superb and kept everyone moving along, Santaconga'ing, dancing, chanting "What do we want? Christmas. When do we want it? Now! Hohooooooooooooooo!" & singing Xmas Songs like Jingle Bells & Rudolph the Red Nosed Reindeer. 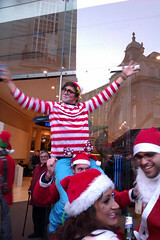 The dancing continued into Carnaby Street and moved on to Argyll Street heading towards Oxford Street. We were stopped by a row of linked armed police from going onto Oxford Street, but instead of it turning nasty, we just carried on dancing & eventually turned round to head towards Bloomsbury. 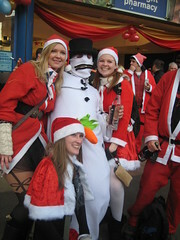 @Jemimah_Knight and myself left at this point as we were freezing, tired and wanted to avoid the crush on the Tube home. 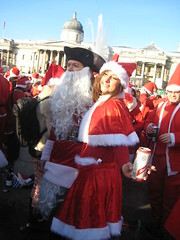 My full set of Flickr pictures from Santacon 2011 London are here & @Jemimah_Knight's here too. 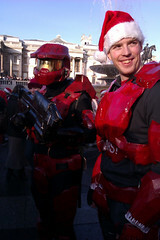 I had a fab time and would certainly go again. 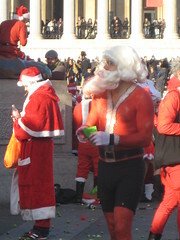 Just remember to wrap up well, although a number of scantily clad "Lingerie Santas" were showing how Londoners can brave out the winter weather.